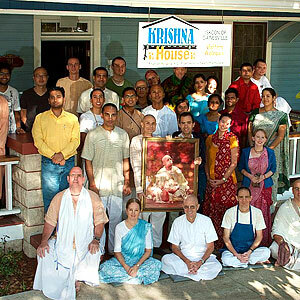 ISKCON Gainesville (Krishna House) is most widely known for facilitating Krishna Lunch, a community service operation that has been serving healthy vegetarian meals to students and the larger Gainesville community for forty years on campus at the University of Florida. Currently, Krishna Lunch serves thousands of students every week. In addition to the Krishna Lunch program, Krishna House offers an educational program designed to provide full-immersion experiences for students interested in practicing bhakti yoga in a temple atmosphere. Please visit the website for more information on regularly schedules services and further events.